We offer you quality and personalized accommodation while experiencing San José. We embrace diversity in a co-living environment that provides you comfort in each of our unique spaces not only for a great rest but for creativity, relaxation, and cultural experiences. We're a small hostel and like to pay special attention to details to make your stay more pleasant and grant you the comfort you need during your visit to San José, whether it's a short or long one. We are in La Sabana, which is close enough to the main downtown area but away from the noise and crowds. At Capital Hostel de Ciudad you'll find different areas to share, create, collaborate, inspire and get inspired. - Backyard with BBQ facilities and space for yoga. - Entertainment area with pool table, video projector, musical instruments, vinyl player, board games. - Book exchange and reading area. 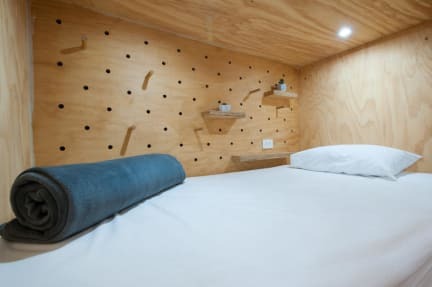 - Pods in shared dorms: All of our pods have 3 mini shelves and a big sized secured drawer for your belongings, as well as two independent lights and electrical outlets. The pods have a curtain for extra privacy, since our doorms are on an open-floor format. All linen and towels are included. 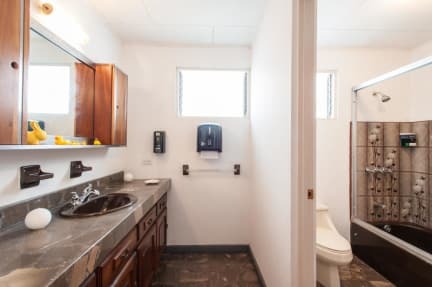 Independent showers, toilets, and sinks are just a couple of steps away. - Private rooms with shared bathroom: These room type has a maximum capacity of 3 people. It has one queen sized bed and a twin sized bed. The ensuite bathroom is shared with another triple room only. Fan, big closet for your belongings and a 32' TV with cable are also a part of this room. - Private room with private bathroom: This rooms has two queen sized beds, private ensuite bathroom with bathtub, and a walk-in closet. You will also enjoy a desk, fan and a 32' TV with cable. This room has an indoor patio view where natural light will energize you to start each morning. Regarding location, we are just a couple of blocks south from La Sabana Metropolitan Park in San José (Mata Redonda district). Very easy access to/from the airport, San José downtown, Escazu area and more. Find us on Google Maps or Waze under Capital Hostel de Ciudad. La Sabana Park is where the National Stadium and the Costa Rican Art Museum are located. The park is also a great spot for any outdoor activity and sport. Fairs, festivals and special events are also often held here. Nearby you'll find grocery stores, a small supermarket, a pharmacy, small local restaurants and international food restaurants. Also, we're conveniently located half block from "Sabana-Estadio" bus stop, which takes you directly downtown and connects you to any other bus stop in San José. If you are more of a walking person, you can also get to the main downtown area within a 30-minute walk. Email us for more information on how to get here from the airport and we'll provide you with all the different options. Honestly, just a really really chill hostel that was very clean and had everything you could need. Would highly recommend. Best Hostel I have ever stayed in! It was a great stay and we highly recommend this place! The staff was so friendly and everything Perfect. Comfortable beds and a nice atmosphere. I was in town to visit some friends, and my stay was fantastic. Everything was clean and comfortable, with complementary breakfast. The staff were also super helpful with recommendations and what not! This was an amazing place to stay. Excellent communication, lovely communal spaces and great clean bathrooms. Really enjoyed the vibe and the thoughtfulness that has gone into the place. Free breakfast is a bonus too. A nice modern hostel. Breakfast was excellent (really good coffee) and the staff was very helpful in helping me plan the rest of my costa trip up north. The only negative is that the location is not very central, but it is easy and relatively cheap to get around by uber. Also it’s relatively accessible from the airport by public bus if you are willing to walk about about a mile once in town. Overall a great place to spend a night as a jumping off point for your trip. Loved it! Spacious shower, spacious lounges! Nice breakfast with pancakes, eggs, beans, and fruits. Really nice terrace with beautiful greens and flowers! The bed is a pod style with a curtain that has more than two plugs to charge your phone and laptop. Also I found it convenient to have hooks inside the pod where you can hang your towel and jacket! The staff (forgot her name) was very nice and helpful! It's located in a and safe location within only two blocks to the super market.